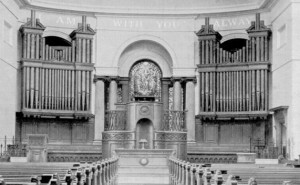 The Willis organ was built in 1882 for St George’s Church, Charlotte Square, Edinburgh as a 2 manual instrument by Henry Willis I (Father Willis). The church had been built in 1814 and for the first 68 years music was provided by an unaccompanied choir, as the tradition in the Scottish church did not include pipe organs. 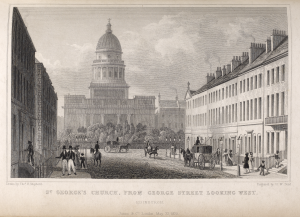 The 1880s were the height of the organ building period during the second half of the 19th century, when many churches were being built and many town halls were having concert organs installed. Henry Willis I was the most prolific and successful organ builder of the period. 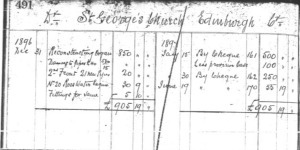 However St George's had previously approached Harrison & Harrison for a quote for an organ in 1879 (they provided an estimate for a 4 manual instrument at £1,200 and a 3 manual instrument at £900). 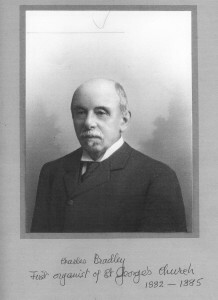 In 1896 it was enlarged by Henry Willis I and II to 3 manual. 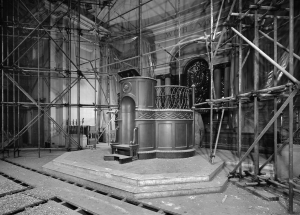 In 1914 some cleaning work was carried out (see the Willis ledger 1914) and further cleaning was done in 1925 (which appears to have been carried out on the direction of Willis III using a local sub-contractor/representative, according to the Kirk Session records). In 1932 Henry Willis III enlarged the organ a bit more (with further stops of pipes) and replaced the old console with a new electric console. 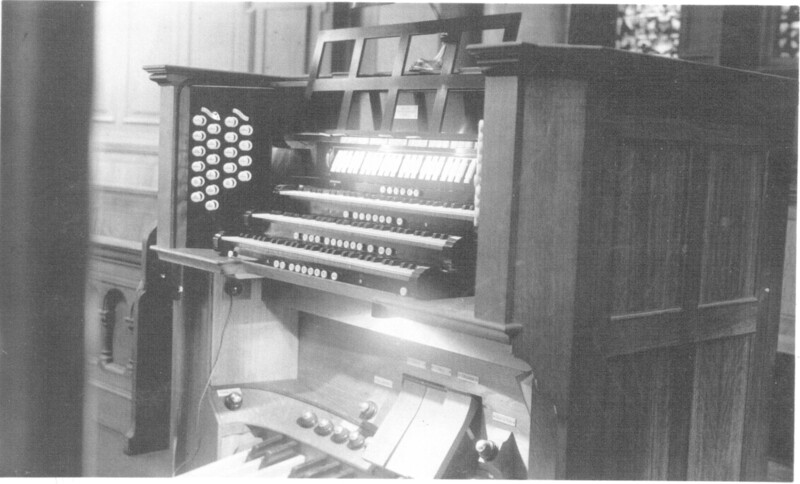 Although Henry Willis III planned to include 3 new stops in the choir (Tierce, Nazard and Piccolo), only the stop knobs were installed in the new console but the pipes were not included at the time. A 1933 issue of the Rotunda (a magazine by Henry Willis & Sons Ltd) gave a full outline of the restoration and enlargement work carried out by Henry Willis III in 1932 and included a specification, which indicated that he had installed the 16ft Waldhorn pipes in the Swell. To read more about the evolution of the organ pipe specification see the organ evolution chart. 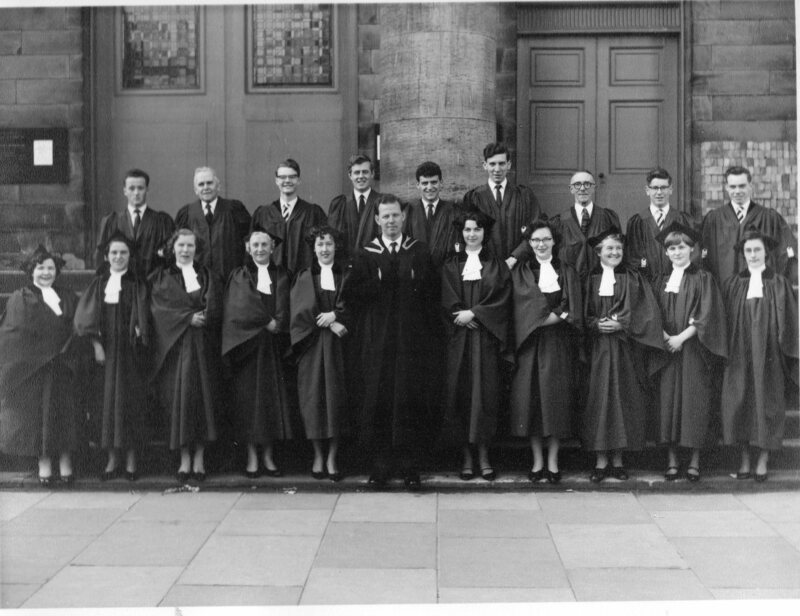 In 1959 the St George’s church building was discovered to have a serious case of dry rot and although a major fundraising campaign raised a lot of money towards the church repair, the problem was found to be beyond the means of the congregation so the church was closed and the congregation moved to join its sister church St Andrews at the other end of St George's street. 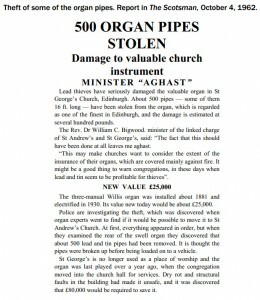 The congregation investigated having the Willis organ moved to St Andrews church but it was too big. An article in the Scotsman dated 4 January 1962 showed the interior of the church, with the organ pipes sheeted up behind plastic. 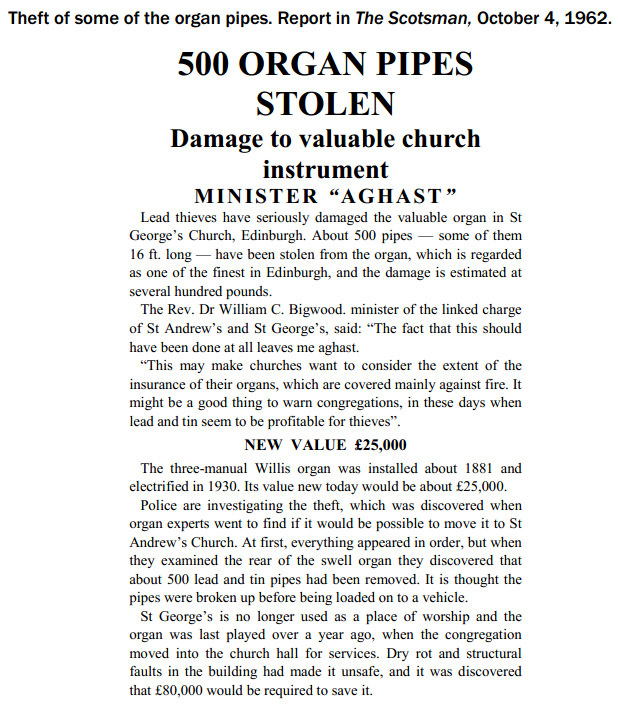 In 1962, soon after closure, 500 metal pipes were stolen from the organ (from the Swell side), this included the 16ft Waldhorn rank of pipes. 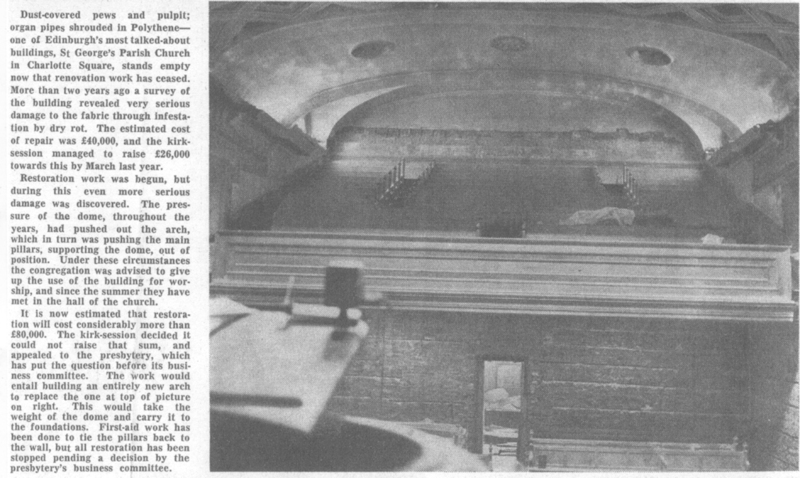 This was reported in The Scotsman on 4 October 1962. In January 1965 the organ was sold to Dr Ingram of Starmer Shaw in Northamptonshire and placed in a barn in Little Horwood for storage. See Coming to SMSG for more information about what happened next. The Kirk Session records from 1880 - 1965 have been researched for information about the organ, choir and music making at St George's Church. The spreadsheet is a transcription of the record books which are entirely handwritten, so in places some words were impossible to decipher. Some further investigations are still planned as there are a few gaps or points to follow up. Download Research at National Archive for Scotland and history - Dec 2015 (Excel spreadsheet) to read what has been transcribed so far. 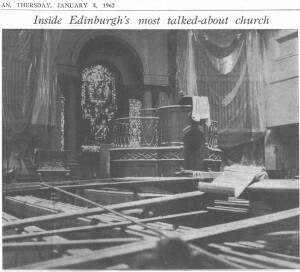 See http://www.musicforallsmsg.org/willis-history-research-in-edinburgh-part-1/ and http://www.musicforallsmsg.org/willis-history-research-in-edinburgh-part-2/ for information about some of our research trips to Edinburgh to discover the history of the Willis organ from 1882-1965. The newspaper articles from The Scotsman are reproduced here by kind permission of The Scotsman newspaper. 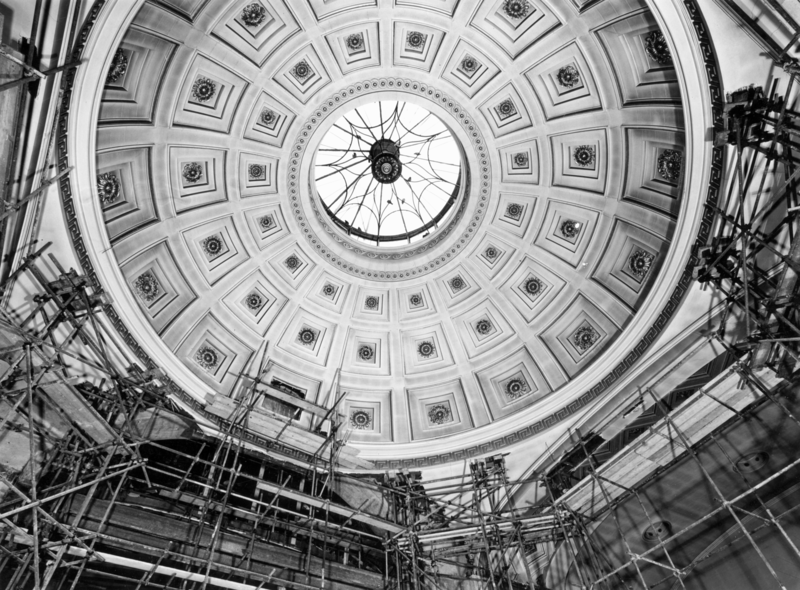 The Willis Ledger images and the Rotunda article are reproduced with permission by Cadbury Research Library: Special Collections, University of Birmingham and British Institute of Organ Studies.